Established in 1907 after the Grand Trunk Pacific Railway line through the Yellowhead Pass was erected, Jasper National Park is the largest of Canada's Rocky Mountain national parks at 10,878 km square (4200 square miles) and is brimming with natural beauty and human history. The rugged mountain terrain and vast valleys where Indians, fur traders, mountaineers, prospectors, railroad surveyors and geologists once explored leaves a lasting impression on those who visit. The Athabasca Glacier, Miette Hotsprings, Sunwapta and Athabasca Falls, Mount Edith Cavell's impressive glaciers and the Maligne Canyon are all accessible by road or ride the tramway to the top of the Whistlers to experience the alpine beauty and varied wildlife ecosystem of Jasper National Park. Here in the park the visitor may explore the Athabasca Glacier by way of one of many Snowcoaches operating here. 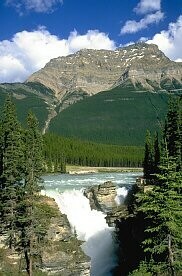 Jasper National Park is located north of Banff National Park via the Icefields Parkway. 1. Whistlers has 781 sites and is located at km 2 (from Jasper townsite) via the Icefields Parkway. 2. Wapiti has 366 sites and is located 3.8 km (2.4 miles) from Jasper townsite via the Icefields Parkway. 3. Wabasso has 232 sites and 6 walk-in sites and is located at km 16 on Highway 93A. 4. Snaring River has 56 sites and 10 walk-in sites and is located at km 11 on Highway 16. 5. Pocahontas has 130 sites and 10 walk-in sites and is located at km 43 in Highway 16. 6. Mt. 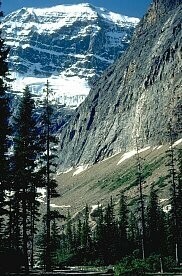 Kerkeslin has 42 sites and is located at km 36 on the Icefields Parkway. 7. Honeymoon Lake has 35 sites and is located at km 52 on the Icefields Parkway. 8. Jonas Creek has 13 sites, 12 walk-in, and is located at km 77 on the Icefields Parkway. 9. Columbia Icefields has 22 sites and 11 walk-in sites and is located at km 109 on the Icefields Parkway. 10. 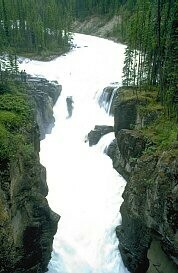 Wilcox Creek has 46 sites and is located at km 111 on the Icefields Parkway. An extensive trail system leads through the park to its many natural wonders. Short day hikes or overnight trips are readily available and vary in degree of difficulty.